I just can’t get enough of the beautiful Obama family. I loved Michelle Obama’s dress at the Inauguration Day. The yellow color gave me a sense of a brand new sunny day, which is full of promises. 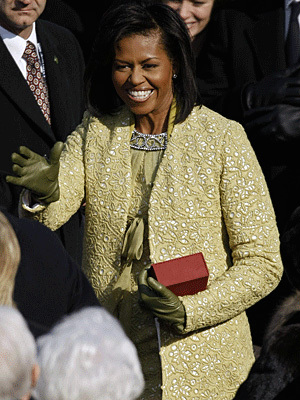 Michelle accessorized the dress with green gloves from J. Crew and green shoes. 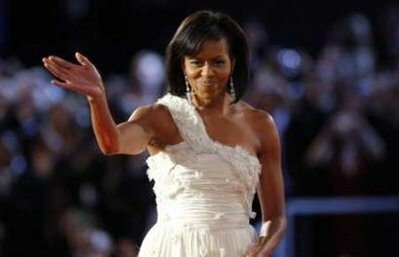 With today’s shaky economy it’s nice to see that even a first lady is not afraid to mix and match. And we can all relate to her! Besides, I’m a huge J. Crew fan, the manager at the J. Crew store here in Scottsdale, AZ, knows me by my name and always greets me when I arrive. So cute. Michelle Obama brings modern chic and fresh look to a first lady. Michelle Obama’s Inaugural white Ball Gown Designed by Jason Wu gave me a sense of a clean slate or a new beginning, since white is such pure color. The dress seems also modern and fresh. Beautiful! 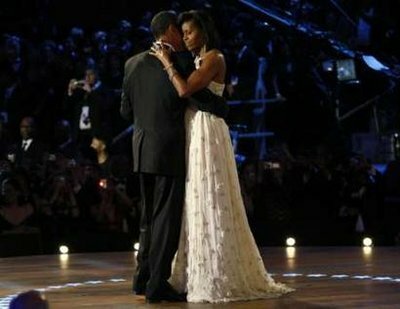 I’m fascinated with the Obama family, same as with the Kennedys and Princess Diana.